Beloved nation of Latvia! Latvians near and far! I offer you sincere greetings on Latvia’s Centenary. I am truly honoured to celebrate this historic moment, this first Centenary, together with you. To celebrate with faith in our people and love of our country, Latvia. 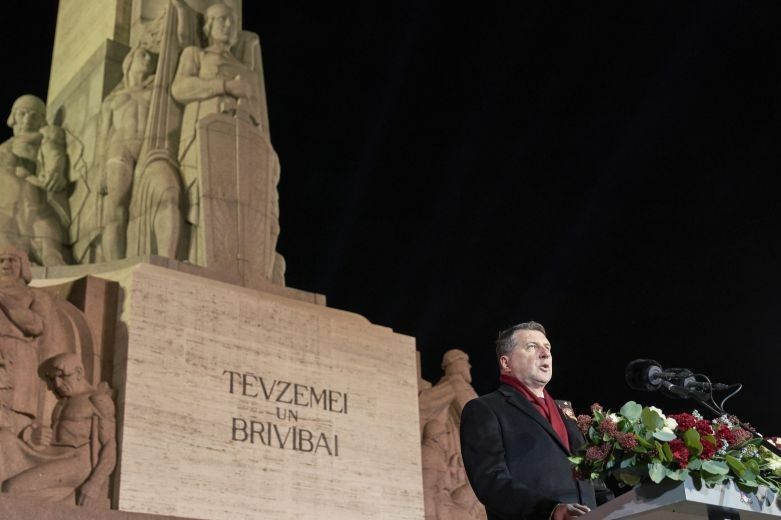 At this moment, here by the Freedom Monument and everywhere in the world where Latvia’s birthday is celebrated, we experience the first hours of our second century. Today we have our fatherland – an independent state – and we all have our freedom. Despite wars and occupations, the hardest has been won, the most precious - protected. This is the moment to imagine an ideal Latvia. The kind of Latvia that we shall build each coming day is only in our own hands. When Latvia was only 10 years old, Rainis said: “not to want democracy, in Latvia’s circumstances, [means] not to want a Latvian state”. These words are true today, at our Centenary, and will always be true. Only a democratic country can guarantee equal rights under law and security for every one of us. We must all stand up for our country. In the future I see a nation which proudly talks in the Latvian language and whose culture is admired throughout the world. A state where the weakest always receives support and where the outstanding are an inspiration to others to achieve their aims. We are all bound together. Person to person, generation to generation, all together in one Latvia. In Latvia’s second century, I see a well populated Latvia. Where the love for our country, concern for our land and for our closest is inherited from generation to generation. A state where children are raised with love. A state where innovation and new skills are honoured. A state which supports every one’s potential to realise their dreams. Tempered and forged by a hundred years, we are a mature nation. Mature in responsibility for our country as a permanent part of Europe. We have grown up and have accept our role in the future of our shared planet. I see a Latvia where knowledge leads to new discoveries, development and prosperity. So that each of us can benefit and everyone can say – we are wealthy. Today I see a mature Latvia. I see a proud country. A people that contributes to the world, does not grasp or beg. I see far-sighted people who will bequeath to their grandchildren a Latvia stronger than ever. Let us celebrate our Centenary with true pride in what we have achieved and certainty in our future! May our belief and love of our fatherland and freedom inspire us to great works for our Latvia!